The Asian’s leading water industry fair – ASIAWATER 2016 took place in Kuala Lumpur from 06 April 2016 to 08 April 2016. 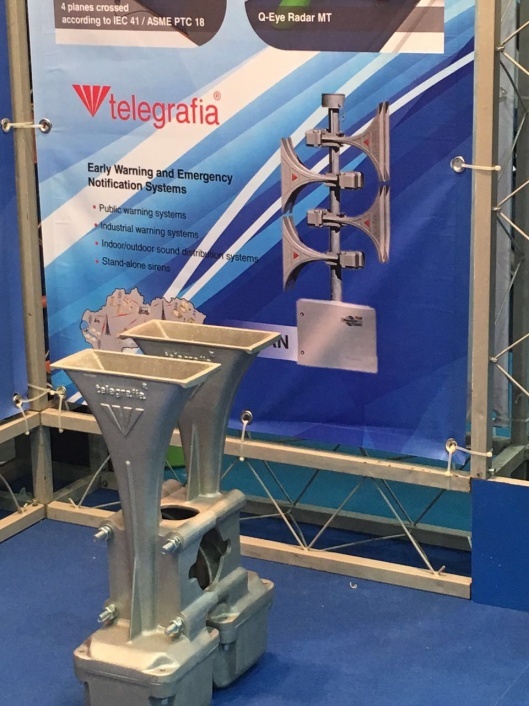 As these trade fairs are an important marketing tool for all prominent industry leaders, Telegrafia could not miss the opportunity to present its modern electronic sirens. Our company is a top electronic siren manufacturer, having a wealth of experience in the implementation of industrial warning and notification systems, flood warning systems, and dam safety and early warning systems. In order to share our expertise, know-how and experience, the company was successfully represented at the fair by our Malaysian Business Partner. Bigger brand exposure and system integration were only a fraction of the goals we plan to achieve. We place great emphasis on maintaining good and healthy relationships with our customers, searching for additional values that strengthen our mutual contacts and creating more space for the deeper understanding of the electronic sirens users need. It is extremely important for us to analyse and understand our customers’ requirements, their plans, and future directions in order to drive our innovations towards more tailor-made solutions that match their requirements and satisfy their high expectations. During those few days of the trade fair, our Partner was able to disseminate the information about technological advantages of our sirens to hundreds of visitors that came to the fair. We tried to use every minute to clearly communicate our message to them – We are the solution for you!